I am wrapping the last gifts to my family and I'm thrilled that I will give them a piece of jewelry and a piece of pottery!!! I am pleased with how they came out and hope that they like them. So far I don't think any of them follow my blog so I'm safe! 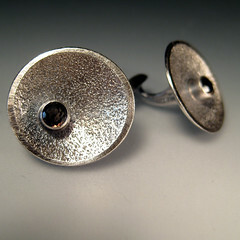 I was especially pleased with how these cufflinks from Leif turned out. I'll have to make some more of these!! !